The role of complimentary or alternative therapies has risen dramatically in the past few decades, and those seeking relief from the symptoms of fibromyalgia make up a large portion of this increase. Although there are many conventional medicines and treatments that may help this condition, it can be very difficult to diagnose and treat with 'normal' medical therapies, which leads to some of those who have the condition to seek additional or alternative help. 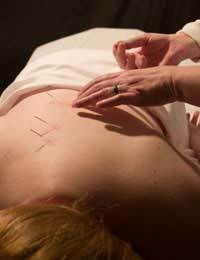 Therapies that are becoming increasingly relied upon for offering this relief are acupuncture and acupressure. Acupuncture is an ancient oriental practice that involves a trained practitioner applying needle tips to certain points of the body. These points are thought to open up and unblock energy channels. By unblocking these points the energy is permitted to flow freely through the ‘meridians’. Meridians are the pathways of energy through which positive and negative energies flow, these pathways are thought to end at the points where the needles are inserted when using acupuncture. By releasing the build up negative pathways, the energy is free again and gaining a better balance of energies is more achievable. Many people fear acupuncture because of the use of needles, but the needles that are used for this practice are incredibly fine and do not particularly hurt when they are applied, in fact many people are not aware that they have been had a needle inserted. Acupressure is very similar to acupuncture and relies on using the points on the body, but instead of inserting needles to the skin, the area is pressed using the fingertips so pressure unblocks the channels instead of a needle point.Unlike reflexology which concentrates on the hands and feet, acupressure uses the same pressure points as acupuncture, and is not solely focused on the extremities. How Do They Help Fibromyalgia Sufferers? Studies have shown that both acupuncture and acupressure (predominantly acupuncture) are highly beneficial for fibromyalgia sufferers. The actual physiological reasons are not clear but research has shown that fatigue, stress and anxiety are significantly lower in those patients who have received acupuncture. Experts are not sure exactly how much the improvement of symptoms is related to biological processes and how much should be apportioned to psychological issues. Nevertheless, the results have shown that there is a marked improvement in these areas. Where Do I Go For This Treatment? Unfortunately as fibromyalgia is so difficult to diagnose and treat, acupuncture and acupressure may not be widely available in all NHS Trusts. It may depend on where you live, the expertise of your specialist and which pain services are offered in your area as to whether you can receive this treatment or not. If you can’t get a referral to an acupuncture therapist within the NHS you can book a private appointment. This may be with a practitioner who is known in your local Trust or by your GP or you can find details in your local telephone directory or on the internet. It is recommended that thorough research regarding the costs and service offered by the practitioner is carried out as the treatment and expertise of the person may vary depending on their training and experience. It might be worth joining a local fibromyalgia support group (if you have one in your area) and find out if other sufferers have used these therapies in the past and who they used before you spend any money. Acupuncture and acupressure are both considered to be complimentary therapies although their benefits to health are now being recognised and taken seriously by professional healthcare workers. Their use for fibromyalgia patients is still fairly limited although the research has so far suggested that they are beneficial.